حشمتی, امین الله. (1397). کاربرد زنجیره‌ی تأمین بهداشت و درمان در هنگام وقوع بحران و بلایای طبیعی. تصمیم گیری و تحقیق در عملیات, 3(4), 359-367. امین الله حشمتی. "کاربرد زنجیره‌ی تأمین بهداشت و درمان در هنگام وقوع بحران و بلایای طبیعی". تصمیم گیری و تحقیق در عملیات, 3, 4, 1397, 359-367. حشمتی, امین الله. (1397). 'کاربرد زنجیره‌ی تأمین بهداشت و درمان در هنگام وقوع بحران و بلایای طبیعی', تصمیم گیری و تحقیق در عملیات, 3(4), pp. 359-367. حشمتی, امین الله. کاربرد زنجیره‌ی تأمین بهداشت و درمان در هنگام وقوع بحران و بلایای طبیعی. تصمیم گیری و تحقیق در عملیات, 1397; 3(4): 359-367. گروه مهندسی صنایع، دانشگاه صنعتی سجاد، مشهد، ایران. موضوع مدیریت زنجیره‌ی تأمین بهداشت و درمان یکی از موضوعات جالب و موردعلاقه پژوهشگران در سال‌های اخیر است. در هنگام وقوع بلایای طبیعی و به‌وجود آمدن شرایط بحرانی، زنجیره‌ی تأمین بهداشت و درمان نقش بسیار مهم و تأثیرگذاری در کاهش تلفات و صدمات و در نهایت نجات جان قربانیان بازی می‌کند؛ از این‌رو مسئله‌ی ادغام زنجیره‌ی تأمین بهداشت و درمان با زنجیره‌ی تأمین بحران در هنگام وقوع بلای طبیعی اهمیت پیدا می‌کند. در این مقاله، پژوهش‌های انجام شده در حوزه‌ی زنجیره‌ی تأمین بهداشت و زنجیره‌ی تأمین بحران به‌صورت کامل مورد بررسی قرار گرفته است. پس از تجزیه و تحلیل این پژوهش‌ها، مسائل چالش‌برانگیز و فرصت‌های تحقیقاتی در موضوع ادغام زنجیره‌ی تأمین بهداشت و درمان و زنجیره‌ی تأمین بحران در هنگام وقوع بلای طبیعی برای کار در آینده پیشنهاد گردیده است. این مسائل شامل اختلال در سیستم حمل و نقل زنجیره‌ی تأمین در شرایط بحران، مدل موجودی مناسب مراکز درمانی درگیر در زنجیره‌ی تأمین در شرایط بحران، یکپارچگی بخش‌های مختلف زنجیره‌ی تأمین در شرایط بحران و در نهایت گسترش کاربرد فناوری اطلاعات در زنجیره‌ی تأمین در شرایط بحرانی می‌باشد. Department of Industrial Engineering, Sadjad University of Technology, Mashad, Iran. Healthcare supply chain management, is one of the interesting topics for researchers in recent years. In the event of natural disasters and the creation of crisis situations, healthcare supply chain plays a very important and effective role in reducing fatalities and injuries, and ultimately save the lives of victims. So matters the integration of healthcare supply chain with crisis supply chain in the event of a natural disaster. In this paper, have been investigated the studies in the field of health supply chain and crisis supply chain, completely, and after analyzing these studies, have been proposed challenging issues and research opportunities in the integration of healthcare supply chain, and crisis supply chain in the event of natural disaster for future work. These issues are including of disruptions in supply chain transportation system in crisis circumstances, appropriate inventory model of the medical centers involved in the supply chain in crisis circumstances, integration of different parts of the supply chain in crisis circumstances and expanded use of information technology in the supply chain in critical circumstances. Aptel, O., & Pourjalali, H. (2001). Improving activities and decreasing costs of logistics in hospitals: a comparison of US and French hospitals. The international journal of accounting, 36(1), 65-90. Azadeh, A., Haghighi, S. M., Gaeini, Z., & Shabanpour, N. (2016). Optimization of healthcare supply chain in context of macro-ergonomics factors by a unique mathematical programming approach. Applied ergonomics, 55, 46-55. Bendavid, Y., & Boeck, H. (2011). Using RFID to improve hospital supply chain management for high value and consignment items. Procedia computer science, 5, 849-856. Bhakoo, V., & Choi, T. (2013). The iron cage exposed: Institutional pressures and heterogeneity across the healthcare supply chain. 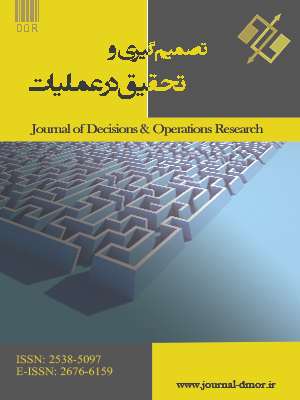 Journal of operations management, 31(6), 432-449. Breen, L., & Crawford, H. (2005). Improving the pharmaceutical supply chain: assessing the reality of e-quality through e-commerce application in hospital pharmacy. International journal of quality & reliability management, 22(6), 572-590. ÇAkıCı, Ö. E., Groenevelt, H., & Seidmann, A. (2011). Using RFID for the management of pharmaceutical inventory—system optimization and shrinkage control. Decision support systems, 51(4), 842-852. Chakravarty, A. K. (2014). Humanitarian relief chain: rapid response under uncertainty. International journal of production economics, 151, 146-157. Chan, H. L., Choi, T. M., Hui, C. L., & Ng, S. F. (2015). Quick response healthcare apparel supply chains: value of Chen, D. Q., Preston, D. S., & Xia, W. (2013). Enhancing hospital supply chain performance: A relational view and empirical test. Journal of operations management, 31(6), 391-408. Chong, A. Y. L., Liu, M. J., Luo, J., & Keng-Boon, O. (2015). Predicting RFID adoption in healthcare supply chain from the perspectives of users. International journal of production economics, 159, 66-75. Dacosta‐Claro, I. (2002). The performance of material management in health care organizations. The international journal of health planning and management, 17(1), 69-85. Duan, Q., & Liao, T. W. (2014). Optimization of blood supply chain with shortened shelf lives and ABO compatibility. International journal of production economics, 153, 113-129. Essoussi, I. E. (2015, October). A performance evaluation of some collaborative inventory management practices in the healthcare supply chain. International conference on industrial engineering and systems management (IESM), (pp. 277-284). IEEE. Fahimnia, B., Jabbarzadeh, A., Ghavamifar, A., & Bell, M. (2017). Supply chain design for efficient and effective blood supply in disasters. International journal of production economics, 183, 700-709. Fakhruddin, S. H. M., & Chivakidakarn, Y. (2014). A case study for early warning and disaster management in Thailand. International journal of disaster risk reduction, 9, 159-180. Gatignon, A., Van Wassenhove, L. N., & Charles, A. (2010). The Yogyakarta earthquake: humanitarian relief through IFRC's decentralized supply chain. International journal of production economics, 126(1), 102-110. Gupta, A., Evans, G. W., & Heragu, S. S. (2013). Simulation and optimization modeling for drive-through mass vaccination–A generalized approach. Simulation modelling practice and theory, 37, 99-106. Hale, T., & Moberg, C. R. (2005). Improving supply chain disaster preparedness: A decision process for secure site location. International journal of physical distribution & logistics management, 35(3), 195-207. Hosseinifard, Z., & Abbasi, B. (2018). The inventory centralization impacts on sustainability of the blood supply chain. Computers & operations research, 89, 206-212. Hovav, S., & Tsadikovich, D. (2015). A network flow model for inventory management and distribution of influenza vaccines through a healthcare supply chain. Operations research for health care, 5, 49-62. Jabbarzadeh, A., Fahimnia, B., & Seuring, S. (2014). Dynamic supply chain network design for the supply of blood in disasters: a robust model with real world application. Transportation research part e: logistics and transportation review, 70, 225-244. Jahantigh, F. F., & Malmir, B. (2015, March). Development of a supply chain model for healthcare industry. International conference on industrial engineering and operations management (IEOM), (pp. 1-5). IEEE. John, L., & Ramesh, A. (2012). Humanitarian supply chain management in India: a SAP-LAP framework. Journal of advances in management research, 9(2), 217-235. Kabra, G., & Ramesh, A. (2015). Segmenting critical factors for enhancing the use of IT in humanitarian supply chain management. Procedia-Social and behavioral sciences, 189, 144-152. Reyes, P. M., Li, S., & Visich, J. K. (2012). Accessing antecedents and outcomes of RFID implementation in health care. International journal of production economics, 136(1), 137-150. Katsaliaki, K., & Brailsford, S. C. (2007). Using simulation to improve the blood supply chain. Journal of the operational research society, 58(2), 219-227. Kelle, P., Woosley, J., & Schneider, H. (2012). Pharmaceutical supply chain specifics and inventory solutions for a hospital case. Operations research for health care, 1(2-3), 54-63. Kumar, A., Ozdamar, L., & Ning Zhang, C. (2008). Supply chain redesign in the healthcare industry of Singapore. Supply chain management: an international journal, 13(2), 95-103. Kumar, A., & Rahman, S. (2014). RFID-enabled process reengineering of closed-loop supply chains in the healthcare industry of Singapore. Journal of cleaner production, 85, 382-394. Kumar, S., & Havey, T. (2013). Before and after disaster strikes: A relief supply chain decision support framework. International journal of production economics, 145(2), 613-629. Kwon, I. W. G., Kim, S. H., & Martin, D. G. (2016). Healthcare supply chain management; strategic areas for quality and financial improvement. Technological forecasting and social change, 113, 422-428. Lin, Y. H., Batta, R., Rogerson, P. A., Blatt, A., & Flanigan, M. (2011). A logistics model for emergency supply of critical items in the aftermath of a disaster. Socio-Economic planning sciences, 45(4), 132-145. Lu, M. T., Lin, S. W., & Tzeng, G. H. (2013). Improving RFID adoption in Taiwan's healthcare industry based on a DEMATEL technique with a hybrid MCDM model. Decision support systems, 56, 259-269. Meiller, Y., Bureau, S., Zhou, W., & Piramuthu, S. (2011). Adaptive knowledge-based system for health care applications with RFID-generated information. Decision support systems, 51(1), 198-207. Mensah, J. Annan, J. & Asamoah, D. (2015). Optimizing drug supply chain in hospital pharmacy department: an empirical evidence from a developing country. Business and economic research, 5(25), 153-169. Mete, H. O., & Zabinsky, Z. B. (2010). Stochastic optimization of medical supply location and distribution in disaster management. International journal of production economics, 126(1), 76-84. Mohanty, A., & Chakravarty, N. (2013). An epidemiological study of common drugs in the health supply chain: where does the compass point? Journal of humanitarian logistics and supply chain management, 3(1), 52-64. Mustaffa, N. & Potter, A. (2009). Healthcare supply chain management in Malaysia: a case study. Supply chain management: an international journal, 14(3), 234-243. Matsuo, H. (2015). Implications of the Tohoku earthquake for Toyota׳ s coordination mechanism: Supply chain disruption of automotive semiconductors. International journal of production economics, 161, 217-227. Nagurney, A., & Nagurney, L. S. (2012). Medical nuclear supply chain design: A tractable network model and computational approach. International journal of production economics, 140(2), 865-874. Narayana, S. A., Pati, R. K., & Vrat, P. (2014). Managerial research on the pharmaceutical supply chain–a critical review and some insights for future directions. Journal of purchasing and supply management, 20(1), 18-40. Nicholson, L., Vakharia, A. J., & Erenguc, S. S. (2004). Outsourcing inventory management decisions in healthcare: Models and application. European journal of operational research, 154(1), 271-290. Priyan, S., & Uthayakumar, R. (2014). Optimal inventory management strategies for pharmaceutical company and hospital supply chain in a fuzzy–stochastic environment. Operations research for health care, 3(4), 177-190. Pujawan, I. N., Kurniati, N., & Wessiani, N. A. (2009). Supply chain management for disaster relief operations: principles and case studies. International journal of logistics systems and management, 5(6), 679. Rachaniotis, N. P., Dasaklis, T. K., & Pappis, C. P. (2012). A deterministic resource scheduling model in epidemic control: A case study. European journal of operational research, 216(1), 225-231. Rahman, F., Bhuiyan, M. Z. A., & Ahamed, S. I. (2017). A privacy preserving framework for RFID based healthcare systems. Future generation computer systems, 72, 339-352. Romero, A. (2013). Managing medicines in the hospital pharmacy: logistics inefficiencies. Proceedings of the world congress on engineering and computer science (pp. 1-6). San Francisco, USA. Saedi, S., Kundakcioglu, O. E., & Henry, A. C. (2016). Mitigating the impact of drug shortages for a healthcare facility: an inventory management approach. European journal of operational research, 251(1), 107-123. Scarpin, M. R. S., & de Oliveira Silva, R. (2014). Humanitarian logistics: empirical evidences from a natural disaster. Procedia engineering, 78, 102-111. Salehi Shahrabi, M. (2015). Reducing errors by RFID technology to achieve lean healthcare. International journal of hospital research, 4(2), 95-101. Stewart, G. T., Kolluru, R., & Smith, M. (2009). Leveraging public-private partnerships to improve community resilience in times of disaster. International journal of physical distribution & logistics management, 39(5), 343-364. Syahrir, I., & Vanany, I. (2015). Healthcare and disaster supply chain: literature review and future research. Procedia manufacturing, 4, 2-9. Toba, S., Tomasini, M., & Yang, Y. H. (2008). Supply chain management in hospital: a case study. California journal of operations management, 6(1), 49-55. Tsui, M., Wilson, D. I., Merry, H., Phulwani, K., & Dooley, M. J. (2008). Implementing a Hospital Vendor‐Managed Inventory System. Journal of pharmacy practice and research, 38(1), 40-43. Vanany, I., Maryani, A., Amaliah, B., Rinaldy, F., & Muhammad, F. (2015). Blood traceability system for Indonesian blood supply chain. Procedia manufacturing, 4, 535-542. Zahraee, S. M., Rohani, J. M., Firouzi, A., & Shahpanah, A. (2015). Efficiency improvement of blood supply chain system using Taguchi method and dynamic simulation. Procedia manufacturing, 2, 1-5. Zepeda, E. D., Nyaga, G. N., & Young, G. J. (2016). Supply chain risk management and hospital inventory: Effects of system affiliation. Journal of operations management, 44, 30-47.